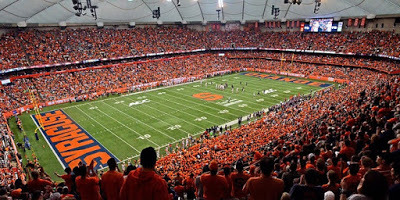 Are you heading to upstate New York for the LSU vs. Syracuse game next weekend? This is not normal territory for our Tiger fans so we want to fill you in on what to see, eat, drink and do while in Syracuse! Thanks to Visit Syracuse, we&apos;ve got the scoop! You will also see information sited from a tailgating blog - Syracuse Tailgate and Visitor&apos;s Guide 2015 that we encourage you to read in full! The Syracuse airport is about 5 miles north of the downtown/university areas, many local hotels will pick you up in their courtesy shuttles if you want to avoid renting a car. Please note that due to New York laws, Syracuse does not currently have Uber or Lyft. Check out the list of transportation services on the following two sites >> Visit Syracuse Transportation and Need a Cab. Many hotels will be offering shuttles to the Carrier Dome, so if you are staying in a nearby hotel, we suggest calling them ahead of time. If driving, the Carrier Dome is easy to find as it sits east of downtown and is set on top of a hill overlooking the city. Syracuse University provides an overview and has it broken down their parking to three main areas. Get to know the campus of Syracuse with these interactive maps. Marshall Street - Commercial street with shops, restaurants, and bars, about a twenty-minute walk from parking and 10 minutes to the dome. Recommendations: Varsity Pizza, Fagan’s Pub and Chuck&apos;s.
Armory Square - Great place for pre- or post-game fun. A trendy downtown area with great restaurants, entertainment a museum and microbrewery. Recommendations: Pastabilities, Blue Tusk, Kitty Hoynes, Empire Brewing Company, Modern Malt and Al’s. Hanover Square - A smaller version of Armory Square but a great area with restaurants, bars, and live music! Hanover Square caters more to the 25+ crowd. Recommendations: J Ryan&apos;s Pub, World Martini Bar and Prime Steakhouse. With many options of restaurants, we were recommended the following restaurants as a "must try" while in the city - Dinosaur Bar-B-Que, Joey&apos;s Italian Dining, The Blarney Stone, Heidi&apos;s, Creole Soul Cafe, and Funk N Waffles. Some of Syracuse&apos;s favorite bars include Chucks, Kitty Hoynes, Blue Tusk and Al’s. Syracuse has a wide variety of craft beer, so be sure to Sip on Syracuse and visit a local brewery such as Empire Brewing Company, Middle Ages Brewing Company, and Eastwood Brewing Company. 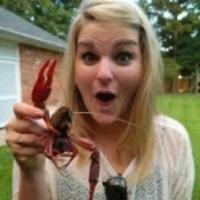 A new element for LSU Tigers on game day - the Carrier Dome serves beer to the general public, not just in the suites. The Dome offers domestic as well as imports and craft beers. A local regional brand is Saranac and they have a vast selection near Section 121, which we have heard is worth the walk if you aren&apos;t sitting near! We&apos;ve also read that everyone should try a Hofmann Coney or Sausage in the Carrier Dome. 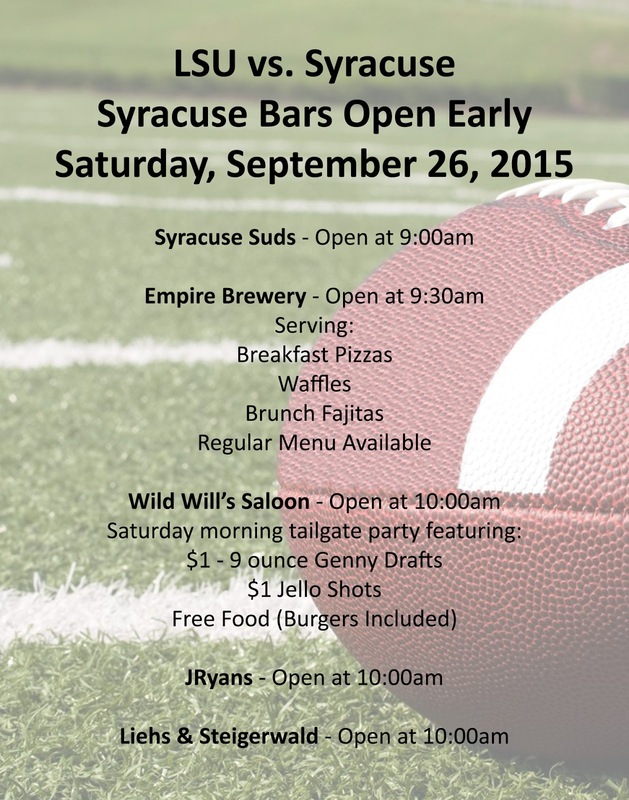 Click here for an entire list of concessions in the Carrier Dome. Destiny USA - The largest shopping, dining and entertainment venue in New York state and 5th largest in the country. Destiny USA is home to the world’s largest indoor suspended ropes course, too! Entertainment for all ages! Also, Dave & Buster&apos;s at Destiny USA is offering a coupon to any Syracuse or LSU fan in school colors that visits over the weekend of Sept 25 - Sept 27. The coupon is good for an extra $20 added on to the purchase of a $20 Power card. They can receive this coupon if the check in at the front desk of the location. 2015 FIL World Indoor Lacrosse Championships will be taking place the same weekend in Syracuse. Look into getting tickets here. Beak and Skiff & 1911 Tasting Room - Enjoy apple picking at Beak & Stiff orchards with your family! Pop on over to the 1911 Tasting Room where you can sip on small batch handcrafted spirits made from apples!